Wow! This is the right way to end a book. Lots of possibility for the next one. So what happens in the second novel? Well, at the beginning Aileana's still trapped and tortured by Lonnrach. He seeks information and her memories are the best way to get them. In order to retrieve them, he needs to drink her blood. Luckily, this Falconer has friends and she's able to return to Edinburgh. However, this is not the Edinburgh she remembers. The world has been destroyed after the Fae attacked. Of course, Aileana blames herself and sure enough, some humans including some of her old friends think it too. I liked this book as much as I did the first one. 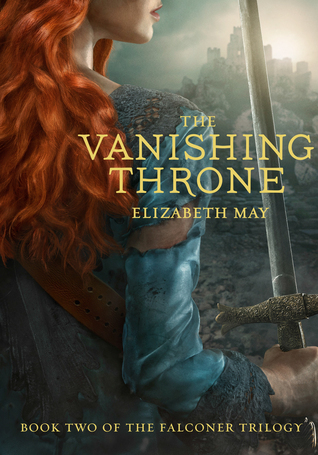 Usually, the second book in a trilogy can have a lot of build-up in preparation to the end but The Vanishing Throne was full of action too. There were plenty of ways for things to go wrong and sure enough, they did. In addition to the action, we get further development in regards to the MC's romance. When Aileana and Kiaran meet again, they have not seen each other for years. They both carry scars which proved what they have both endured. I hate knowing Kiaran's life is attached to Sorcha's. She's evil and she's only going to cause more trouble. In regards to the secondary characters, I love how funny Derrick is. Also, I'm hoping for Gavin to find his true love too. Catherine has matured into a strong woman. She's always on Aileana's side which makes her a true friend. I can't wait to read the Fallen Kingdom. I'm very interested in reading how Mrs. May is going to end it all.